1. 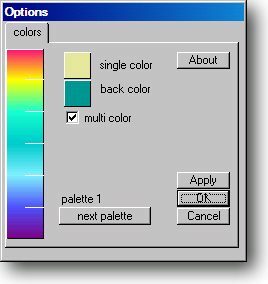 Changing palette to other pre-programmed: Click ::next palette:: button. The control provides up to 10 palletes. 2. Changing (customizing) colors within any palette: Click on any of 8 colors on palette, color selection must appear. Select different custom color. 4. Monochrome palette (single color for the whole surface): Uncheck multi color option box. Select desirable color for surface by clicking "single color" box. 5. Click within "back color" square to change Background color. 1. 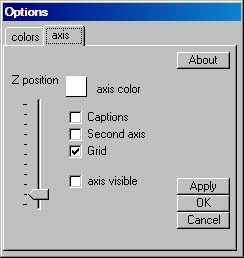 Select Captions, SecondAxis, Grid to unable corresponding option. 3. Provide Z axis elevation level by pushing scroll on left side "Z position"